Transient synovitis is a self-limited unilateral inflammatory synovitis, typically of the hip joint, which represents the most common cause of hip pain in children aged 3–10 years. Although self-limited and treated symptomatically, it is crucial to differentiate this condition from septic arthritis, which requires treatment with surgical drainage and parenteral antibiotics. Although the incidence of this condition in the United States is unknown, it is frequently referred to as the most common cause of hip pain in children, with boys affected twice as often as girls. The etiology remains unknown. Histologic examination of the synovium reveals nonspecific inflammation. Many children are noted to have had a recent or concurrent respiratory or gastrointestinal viral infection, and many authors believe that it may represent a self-limited infection of the synovium or a postinfectious inflammatory response. In one study, increased antibody titers against Epstein–Barr, rubella, enterovirus, or mycoplasma were demonstrated in 67 children out of 80 with this disease, but all synovial viral cultures were negative. Finally, an association between transient synovitis and a positive throat culture for Group A Streptococcus, a positive antistreptolysin O titer, or both has been demonstrated. Clinically, it presents as acute onset hip pain or limp in a well-appearing child. Usually the child is afebrile, or has only a mild temperature elevation. Pain ranges from mild to severe and can be localized to the hip, thigh, or knee. Internal rotation or adduction of the affected hip is limited secondary to pain. Duration of symptoms typically last 1–3 weeks, and prolonged symptoms should suggest a diagnosis other than transient synovitis. Includes septic arthritis, toxic synovitis, osteomyelitis, psoas muscle abscess, rheumatic fever, trauma, pauciarticular arthritis, reactive arthritis, malignancy, SCFE, and LCPD. Laboratory and radiographic studies are done to exclude the aforementioned diagnoses. Radiographs of the hips can be done to exclude SCFE, LCPD, tumor, and osteomyelitis. Ultrasound can be performed to look for the presence of a joint effusion which can be found in as many as 70% of cases. Scintigraphy and computed tomography are less sensitive for the identification of a joint effusion, but may be useful in detecting areas of adjacent osteomyelitis. MRI can be used to differentiate it from septic arthritis. Statistically significant MRI findings in this include contralateral (asymptomatic) hip effusions and the absence of signal intensity abnormalities of the bone marrow. Ipsilateral effusions and synovial thickening and enhancement are present in both conditions, however. The white blood cell count (WBC) is usually within normal limits and the erythrocyte sedimentation rate (ESR) may be normal or only slightly elevated. This is a self-limited condition that resolves with rest and supportive therapy. In one study, treatment with ibuprofen was shown to shorten the duration of symptoms . 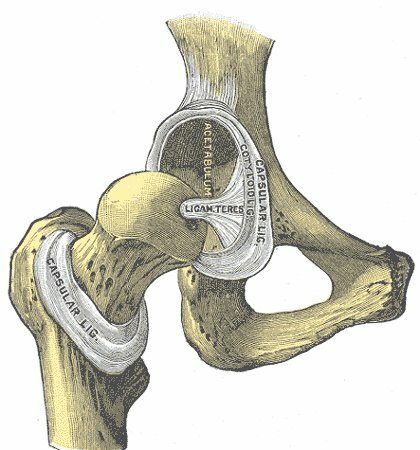 Recurrence of this condition of the hip has been reported to be between 0 and 17% of cases in the literature. The relationship between this synovitis and LCPD remains speculative. In several series, LCPD or coxa magna followed as many as 30% of cases. Some investigators have speculated that the increased intra-articular pressure associated with it could potentially lead to the development of LCPD, while others have found no relationship between the two entities other than the similarity in initial clinical presentation. Although most episodes of recurrent synovitis have a benign course, some patients with early chronic inflammatory conditions may mimic it and further evaluation may be required to rule out these conditions.